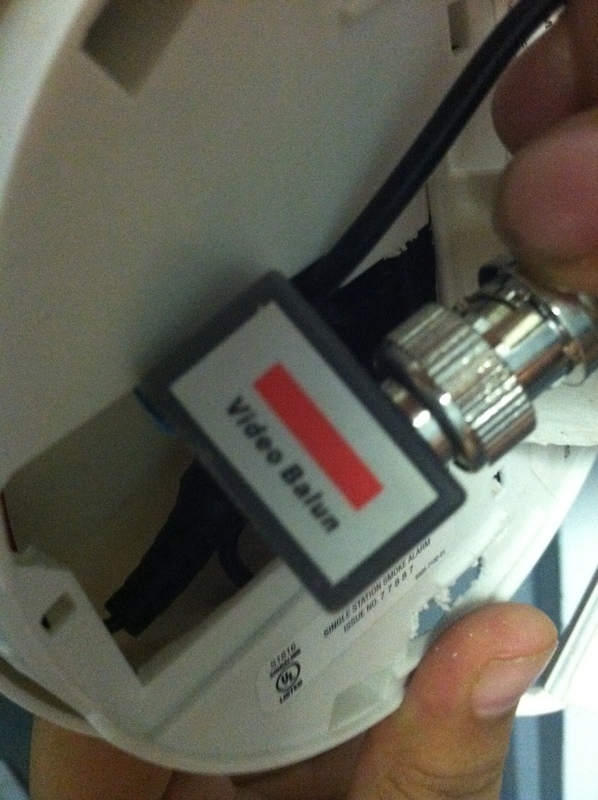 How hidden cameras and housing court are used by one West Side landlord to force out rent-stabilized tenants. This story was first published Oct. 9, 2014 in the West Side Spirit. Gloria Mejia’s son took a long look at the smoke detector in the hallway outside his apartment and knew something was amiss. 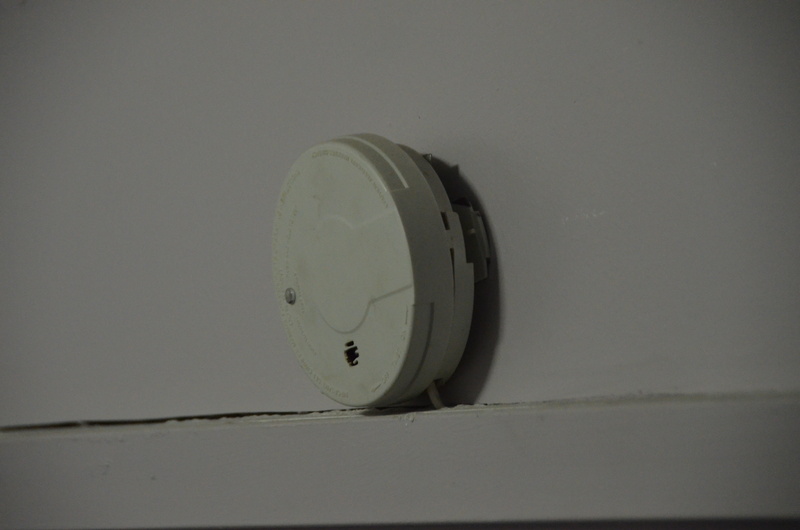 Smoke detectors run on a battery, he told himself, so why does this one look like it’s plugged into the wall? He and his sister took the detector apart. Inside: a tiny camera, apparently installed by the family’s landlord. “The next day the landlord came with a picture of my sister’s face and said if the camera was damaged we’d have to pay to replace it,” he said. Mejia and her two kids live on W. 109 St. in a five-story apartment building between Broadway and Amsterdam. 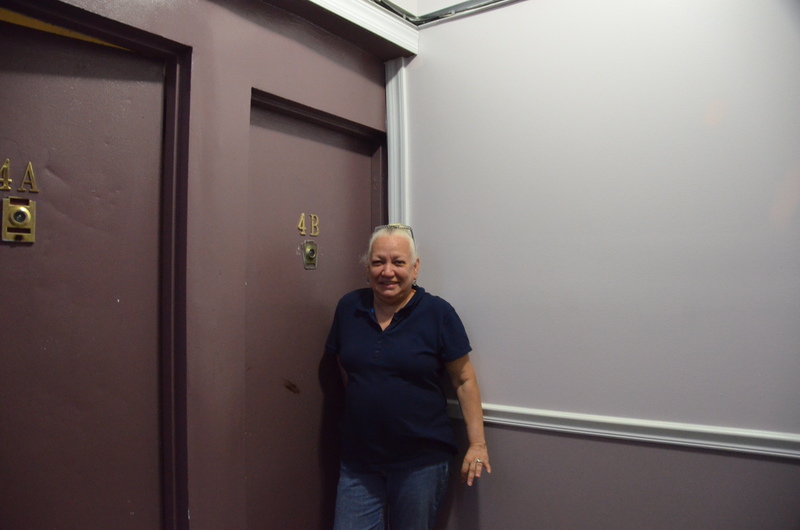 She’s lived in the building since 1968 and pays $664 for her three bedroom, rent-stabilized apartment. Gloria Mejia lives in a rent-stabilized apartment on West 109th Street and says that her landlord has been trying to oust her, claiming that the apartment is not her primary residence. Photo by Daniel Fitzsimmons. The building is owned by the Orbach Group, and is part of a portfolio of 23 buildings on the street that were acquired by the company in 2009 for $45 million. The properties are part of a larger portfolio of more than 70 buildings that Orbach has amassed in the past five years, all of which are located between West End Avenue and Central Park West from 101st Street to 115th Street. Orbach markets apartments in these buildings through a website called CoSo Apartments, targeted at students at nearby Columbia University (CoSo stands for Columbia South). Many of the existing tenants in the CoSo buildings are in rent-stabilized apartments, and many — like the Mejias — complain that Orbach is pressuring them to leave the units so they can be marketed to Columbia students at market rates. Mejia told The West Side Spirit that this summer, the landlord refused to renew her lease, and sent her a 30-day vacate notice in July. When she didn’t budge, the landlord used images from the hidden camera as the basis of an eviction suit that was launched against her in housing court. She often leaves the apartment to visit her elderly mother, who lives next door, and if the landlord could convince the court she wasn’t using her rent-stabilized apartment as a primary residence, Mejia could be evicted. The video camera that tenants discovered hidden in a hallway smoke detector in one Upper West Side building with rent-stabilized units owned by the Orbach Group. She hired a lawyer for about $1,500 and the case was dropped, she said. A few weeks later a new lease arrived in the mail. Then in September a man dropped by the apartment and offered to pay her $75,000 to move out. She didn’t bite. “I’ve been living here in this building since 1968, I got married while I was living here, I raised my kids here, I’m not leaving,” said Mejia, 61. 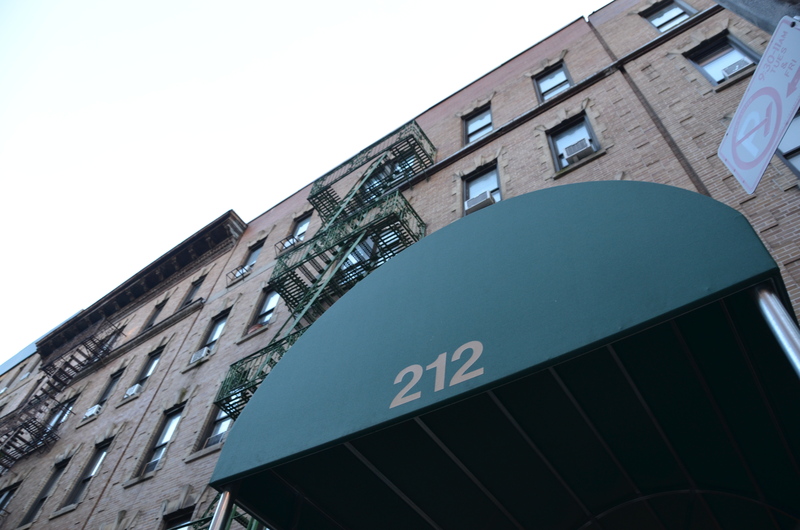 A months-long investigation by the Spirit has found that of the 1,450 apartment units Orbach has acquired since 2009, which are spread out over 73 buildings on the Upper West Side, 66 percent are rent stabilized. 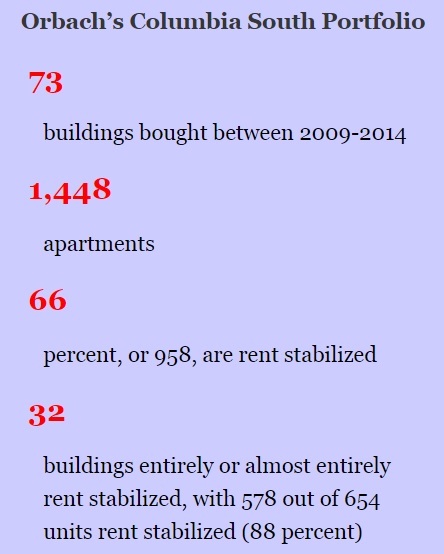 Thirty-two of the properties are entirely or almost entirely rent stabilized; of the 654 units in these 32 buildings, 578 are rent stabilized. All told, the Orbach Group has 958 rent stabilized units under its control, according to records with the Office of the City Register, Dept. of Finance and the Dept. of Housing Preservation and Development. Visitors to the CoSo Apartments website immediately see an interactive color-coded map of the Upper West Side and Columbia University, with icons denoting where each of Orbach’s 73 buildings are in relation to the campus. Clicking on a building icon will tell a visitor how far from Columbia University the building is using public transportation or walking. Luz Garcia pays $872 a month for her Orbach-owned rent stabilized apartment at 120 West 109th Street. She’s lived in the apartment for 23 years and said recently she’s been approached with buyout offers after successfully fending off a non-primary residence suit brought by Orbach, which was dismissed in June. A screenshot from the CoSo Apartments website shows where Orbach’s buildings are in relation to Columbia University. He likened the name “CoSo” to more of a moniker that denotes a specific neighborhood, similar to SoHo in Lower Manhattan, which stands for South of Houston Street. Columbia University did not respond to a request for comment about the CoSo Apartments. The Garcia case was brought, Orbach said, after she told an employee of the management company used by CoSo Apartments that she lives in Arizona for seven months out of the year. Garcia told the Spirit she left New York for a time due to a domestic violence situation, but always maintained the unit as a primary residence. Orbach said Garcia’s case was dismissed purely on procedural grounds. A reading of the court’s decision said Garcia submitted “three affirmative defenses and a counterclaim,” and indicated the case was dismissed because Orbach could not ascertain and file in court papers where Garcia was living in Arizona. As for Mejia, Orbach said there’s still a question of which apartment she uses as her primary residence, and that by law she cannot claim two rent-stabilized units as her primary residence. Mejia told the Spirit her mother has lived in the building since 1968 and her apartment is rent controlled as well as rent stabilized, and that she secured her own rent-stabilized apartment in the building after living with her mother for some years. As for the nine buildings on the CoSo website that are entirely rent stabilized, the spokesperson characterized them as an investment and said the annual turnover rate for rental housing in New York is around 10 percent. The CoSo Apartments logo and tagline. The hidden camera outside Gloria Mejia’s door that monitors her comings and goings. Photo by Daniel Fitzsimmons. The Orbach Group first arrived on Marti Weithman’s radar in 2009, soon after the company acquired the 23 buildings on West 109th Street. Weithman is the president of the Goddard Riverside SRO Law Project, an organization that provides free legal support in housing court to low-income tenants on Manhattan’s West Side. The organization represented Garcia in her eviction case that was dismissed. Weithman is referring to a man named Anthony Falconite, who was the target of a cease and desist order this past summer from State Attorney General Eric Schneiderman, who said the ex-cop forces his way into rent stabilized apartments to gather information and threatens tenants with eviction through harassment and intimidation. That story broke in the Daily News, and Mejia said she recognized Falconite from pictures in the paper as the man who offered her $75,000 to vacate the apartment soon after Orbach renewed her lease. Falconite could not be reached for comment. “Falconite doesn’t work for the company and hasn’t for some time,” said the Orbach Group’s spokesperson. He later said in an email that Falconite actually worked for a management subcontractor used by CoSo Apartments, and that he left that company 18 months ago. The spokesperson maintained that Orbach and its CoSo Apartments subsidiary is a conscientious landlord to all of its tenants. An Orbach-owned building on the Upper West Side. Photo by Daniel Fitzsimmons. But Weithman estimates since 2009 the SRO Law Project has been in contact with more than 200 rent-stabilized tenants that have alleged harassment at the hands of Orbach. Weithman said for every tenant experiencing harassment that reaches out to her organization and others like it, there are those who lack the knowledge or wherewithal to tap into resources designed to help them stay in their homes. These people, she said, simply take buyouts or succumb to other forms of pressure to leave their rent stabilized apartments. This entry was posted in News and tagged Anthony Falconite, Columbia South, Columbia University, CoSo Apartments, Dept. of Housing Preservation and Development, housing, tenant harassment, The Orbach Group. Bookmark the permalink. Excellent article. Another example of corporate greed run rampant. Good investigative reporting. Didn’t leave me with any questions on the issue.